With the recent snowstorm, our state is struggling with downed power lines, lost power, weather-related car accidents and closed schools. Governor Deval Patrick recently spoke with officials from utility companies to learn about the storm’s damage. Until our state can recover from the damage, residents are urged to stay away from down power lines and to stay off the roadway if possible. More than 20 people have died because of storm-related car accidents in New England. One person was electrocuted in Springfield. “There were at the height some 700,000 customers without power, that was down to about half a million earlier this morning and they’ll continue to drive that down,” said Patrick. Our Boston car accident attorneys are here with some simple and helpful safety tips to keep everyone safe until officials are able to restore life to working conditions. The recent storm dumped more than a foot of snow on some parts of the state. More than 600,000 were left without power. As of Sunday night, nearly 500,000 people were still without power. “There are more utility crews out then ever before and they’ve come from all around the Commonwealth and other parts of the country,” said Governor Patrick. In Pennsylvania, nearly 430,000 residents have lost power. Nearly 200,000 people in Philadelphia lost power. About 125,000 residents in Connecticut are without service. New York and New Jersey have also experienced sporadic power outages and nearly 30,000 are out of service in Maryland. With no electricity, icy road conditions, road debris and downed power lines, we urge all motorists to stay off of the roadways. If you absolutely have to venture out of the house and into your vehicle, make sure you do so safely and follow these simple driving tips. -Make sure you have weather worthy tires. Make sure that they’re not worn. Tires can serve as your first line of defense against sliding your way right into an accident. -Make sure you tire pressure meets the tire’s requirements. Cold air causes the air in your tires to contract. -Avoid any sudden movements on our roadways. Only change lanes and make turns when absolutely necessary. -Brake slowly to avoid losing traction, sliding or spinning. -If you start to skid and you’ve got anti-lock brakes, steadily apply pressure to your vehicle’s brakes and turn your wheel in the direction you’re skidding. -If your vehicle gets stuck, don’t spin out your tires. This can make them hot and cause them to burst. Simply rock your vehicle back and forth gently. -Keep your gas tank full. You don’t want to run out of gas in the middle of a storm. -Remember to use your vehicle’s parking brake in rainy, cold and snowy weather. -Never use your cruise control when you’re driving along a slippery road. -Always travel with a cell phone for emergency purposes. -Always carry a breakdown emergency kit. This kit should include road flares, food, water, medications, blankets, hand warmers, gloves hats, a brightly-colored cloth for hour antenna and emergency information. -Make sure your exhaust pipe is always clear. -Accelerate slowly in the snow. -Stop slowly to avoid skidding. -Allow greater following distance between you and the vehicle in front of you. Normal following distances are acceptable at three to four seconds. 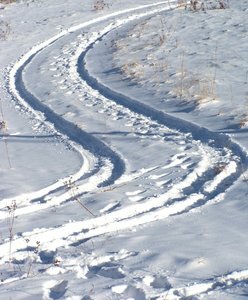 In snowy condition, following time should be eight to ten seconds. -Never stop if your vehicle is climbing an icy hill. If you, a family member or a loved one has been involved in a Boston car accident, contact Boston Injury Attorney Jeffrey S. Glassman for a free and confidential appointment to discuss your rights. Call 877-617-5333.